I hadn’t planned to, but I ended up lining up in the wee hours a couple weeks back for an iPhone 4S. It was more a father-son bonding thing than a geek thing, to be honest. But once the Vancouver media descended on the scene and started interviewing us, well, I felt compelled to buy one, just to show it off for the TV cameras if nothing else. And to be honest, I’m kind of glad I did. The iPhone 4S packs a key technology that clearly demonstrates the future of how we’ll use computers: a service called Siri lets you do things on your iPhone using just your voice. In concept, Siri, isn’t that significant. We’ve theoretically been able to operate our desktop computers with our voices for quite some time. First, it pretty much works, unlike most voice services that have come before (including those from Apple). Second, it’s available away from your desk and it’s baked in. Voice services matter a lot more to the average person when you’re mobile and they’re easy to access. With Siri, Apple has effectively reset the compass on the future direction of personal computing. I remember this night in 1980, standing in the front hallway of my family home in Toronto’s West End. My mom and her best friend, “Aunty” Katherine, were weeping inconsolably in one another’s arms. Their husbands stood by watching them uncomfortably. Me, my sisters, and our faux-cousins were wide-eyed with shock. We’d seen good-byes between the two before, but this was over the top. It was winter. There was snow outside. When they finally parted, literally torn apart by the men, my mom gave something to Katherine. It was her copy of an LP: John Lennon and Yoko Ono’ Double Fantasy. The crying began anew as Katherine, almost without strength, was lead from the house and my mom disappeared upstairs. I stood alone in the living room and watched out the window as Katherine and her family drove away. There was an emotional resonance in the room that I didn’t understand. Years later I learned about the murder of John Lennon, which had happened some time just before that night. This was after I’d learned about the Beatles, and how my mom and Katherine had grown up together listening to them. I heard stories about the two chasing the Beatles together at the Toronto Airport. Over time I pieced together a realization of how the music of the Beatles was a thread in the fabric of life that existed between my mom and Katherine even as time and distance kept the two friends apart. So when Lennon was suddenly gunned down, it was as thought a piece of that fabric had sheared away. But what was lost was not just a part of the way they related to one another, but also an aspect of the way they self-identified and identified with the world around them. Still, I’ve wondered about that night the two wept for Lennon many times over the years, about the strong emotional response they had to the death of someone who essentially was a stranger. I sort of understood it, but I didn’t totally get it. It only finally made sense last week when Steve Jobs died. I learned about the loss as my son was climbing into the bath with an armful of Lego. I was checking Twitter, saw all the messages, and assumed a hoax. Then I checked Apple’s home page on my iPhone and my legs buckled under me. As tears flooded my eyes and I sat down on the bathroom floor, my son looked at me in the same way I must have watched my mom and Aunty Katherine years ago. “Why are you crying, Daddy?” he asked. “The man who makes iPhones and iPads died,” was the best I could manage. Jobs’ impact on not just technology, but culture, media, and society in general is hard to comprehend, much less measure. And while I now understand the emotional impact of Lennon’s death as a result of his musical impact on the world, the loss of Jobs goes far beyond that. Certainly, a piece of the fabric of my life has been torn away by his death. But through his short life’s work, Jobs affected all of us more fundamentally even than that. He changed the way we do things every day, many times a day. Every time any one of us lays a hand on a mouse, it’s because of him. When we interact with pictures on a screen, it’s thanks to him. General, widespread access to handheld computers is a result of his efforts. That virtually everyone now owns a personal computer of some sort is attributable to Jobs. But it’s not just about the way we interact with technology and buy music, or the devices we use. It’s the entire spinoff effect of the revolution in personal computing that he affected until his death. It’s the way he changed the media landscape. The ease with which we buy music online, he made it possible. That we can watch a TV show or movie from any device, anywhere, any time, is thanks largely to Jobs. And these are just a few, generalized examples. It’s fair to say, though, that Jobs didn’t invent many of the technologies he’s know for. No, more importantly, he made them happen. He seized them out of the lab and launched them into the world at large. And almost everything he set free became iconic and fundamental parts of our lives. While my mom and Katherine connected with Lennon through music, every day we each are touched by Jobs when we interact with a smart phone or double-click a picture on a screen or buy a song online. He made technology not only approachable, but loveable and alive. And he altered our perception of what it means to be a technology user and media consumer. To borrow one of his terms, he made our lives magical. So when I learned of his death, my emotional response wasn’t just about the loss of a great person (and great he was). I cried for the realization that the magical ride he’s taken us all on is over. With the death of Jobs, not only technology but culture has stalled. We’re a boat on the ocean and our engine just died, the wind has disappeared from our sails. Steve Jobs is one of the single most influential people in modern history. He has had a direct impact on not only technology use, but our society and culture. It’s absolutely impossible to understate his influence and impact, and I don’t think we are capable of quite comprehending it yet. Unfortunately, his contributions are the result of tireless efforts. He was a human being operating well beyond his natural capacity. And, indeed, Steve Jobs gave a lovely light indeed, perhaps the loveliest we’ve seen. And, like John Lennon, he burned not nearly as long as he should. Now midnight is upon us and the darkness settles in. Who’s going to lead us to the morning? Originally published in the Yukon News on Friday, October 13, 2011. Steve Jobs is dead. What are we gonna do now? I remember one night when I was 9, standing in the front hallway of my family home in Toronto’s West End, watching my mom and her best friend, Aunty Katherine, weeping inconsolably in one another’s arms. My sisters and I and our faux-cousins were wide-eyed with shock. When they finally parted, literally torn apart by the men, my mom gave Aunty Katherine something. It was an LP: Double Fantasy. On the cover was a photograph of a man and a woman kissing. The crying began anew as Aunty Katherine, almost without strength, was lead from the house and my mom disappeared upstairs. I remember standing alone in the living room, watching out the window as Aunty Katherine and her family drove away. Years later I learned about the murder of John Lennon. But it still didn’t make sense to me. Lennon was a rock star, a distant celebrity that neither my mom nor Aunty Katherine had ever met. Why the emotion? I wondered about that night for many years, and it only finally made sense this week when I learned about the death of Steve Jobs. My son was climbing into the bath with an armful of Lego when I checked Twitter. I assumed a hoax. Then I checked Apple’s home page on my iPhone and my legs buckled under me. “Why are you crying, Daddy?” he asked plainly. But I quickly pulled it together, stripped down, and hopped in the tub with him. Only later, alone in the dark of the bedroom while my son slept, did I fully let Jobs’ death hit me and start writing this. My dad bought one of the first Macs a few years after John Lennon was killed. I don’t remember much about it, other than the fact that he thought it was much better than the endless parade of Ataris and Commodores he’d been hauling into the house up till that point. When I bought my own Mac a full decade later, though, my Dad nearly killed me. Like the world in general, he had converted to Windows. It didn’t take me long to understand why. In the mid-90s, Apple and its Mac computers were both a mess. Steve Jobs was gone, having been unceremoniously booted out of the company in 1985, and Apple had since lost its way. The company lacked vision and leadership. Its mediocre products were quickly wearing the Mac cachet thin. Early the next year Jobs returned to Apple and the world – well, the world of Mac geeks, anyway – was breathless with anticipation. Steve Jobs had to save Apple. We were not disappointed. Jobs’ famous reality distortion field quickly became reality itself. The average person would have died satisfied with just the accomplishment of the Mac computer under his belt. He had a much bigger vision in his head. He saw technology as a piece of a total social and cultural picture. He knew that computers didn’t exist in a vacuum. He knew that we, as users of technology, wanted to draw technology into our lives, make it essential. The iMac. The iPod. The iPhone. The MacBook Air. The iPad. That’s an awful lot of “pretty good” stuff. Every one of these products redefined the industry they were introduced into. And while Jobs didn’t “make” every one of these products – they were a collaborative effort with other Apple geniuses like Jony Ive, Tim Cook, and Scott Forstall – it was Jobs’ vision and leadership that made them actually happen. But he went beyond technology, and affected culture and media, too. He purchased the digital effects company that would become Pixar from George Lucas and turned it into the animation studio of the future. Without Jobs, there would be no Cars, Wall-E, or Toy Story. He made iTunes the de facto way to buy music, all but killing piracy and CDs in one fell swoop, and literally transforming the music industry. Besides being a visionary technologist and a skilled leader, Jobs’ greatest strength was just knowing what we wanted. Apple never did product research. We didn’t know we wanted the iPhone until we had it. And I still can’t make a solid argument about why anyone would need or even want an iPad. But everyone I know who has bought one has become instantly addicted to it. Jobs was tapped into our cultural sub-conscious. The past few days since Steve Jobs’ death have born witness to such hyperbole as we rarely witness. Bill Gates said that Jobs had a “profound impact” on the world. “The world has lost a visionary,” says US President Barack Obama. But Steve Jobs was hyperbolic. He was a man that is truly rare. Driven. Visionary. Exemplary. Empathetic. Courageous. Unfailing. Inspiring. He was larger than life, but still seemed familiar. Perhaps most importantly, though, Jobs was believing and dedicated. Before they were proven, his ideas were considered crazy. Even after being introduced, many people wrote off the iPad as one of the dumbest ideas ever. But Jobs believed. He believed he was right, and he remained dedicated to proving it. Those are qualities any one of us would do well to adopt. Believe in yourself. Remain dedicated to your ideas. Don’t let anybody cut you down or tell you different. You’re right. Follow your vision, expose your passion. Make what’s in your head real. “Being the richest man in the cemetery doesn’t matter to me … Going to bed at night saying we’ve done something wonderful… that’s what matters to me,” he said in 1993. It’s indisputable that Jobs had an immeasurable impact on the world that will be felt for decades. More to the point, though, is the emotional connection he made with every one of us through the technology we use. I’ve heard people, time and again, express their love for their Apple gadgets. Truth be told, I love Steve Jobs, in the way a teenager loves a rock star. And Steve Jobs was a rock star. He was my generation’s John Lennon. He informed the way we view the world, the way we work and live. 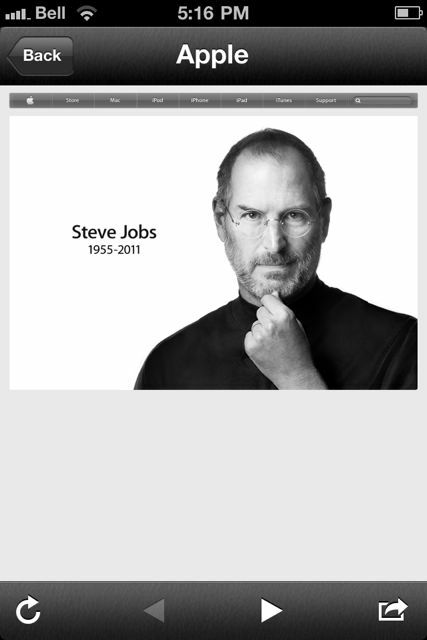 Steve Jobs was truly great. The greatest, perhaps. And he was taken from us too soon. Maybe we should do what Steve would have wanted us to do. Make every effort to become great ourselves.